I loved Woody and as a kid, I had a Woody Woodpecker LP that I listened to and drove my parents, well, they made me close the door to my room when I played it! How Much Wood Could a Woodpecker Peck, if a Woodpecker could peck wood? "Blanc originated the voice, in a characterization similar to his Daffy Duck, minus the lisp, with the recording slightly sped up" (Wikipedia). Yes, he had a maniacal, spaced-out look to him, like he was insane. 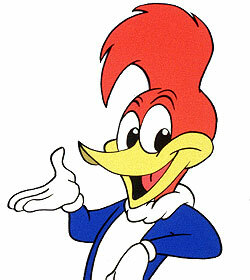 I found the first drawing of Woody Woodpecker a little bit scary...anyone else? Loved the second one. I had forgotten about those live segments, until reading Kids TV Kid posting. They were great. Woody had transformed over the years in both looks and demeanor. I like the older ones best. He was zanier and had a lot more energy, sort of like Roger Rabbit. I remember the live segments..where Mr.Lantz showed his viewers how the cartoons were created and how the characters developed over the years..he even showed his young viewers how to draw "Woody Woodypecker"and his friends properly..using the oval,the pearshape,the hot dog and the circle. That Woody creator's name was Walter Lantz. dtdavis2012, There are some Baby Huey cartoons on YouTube now. At the risk of being politically incorrect, I also liked the Baby Huey cartoons that played alongside of the Woody Woodpecker cartoons. Remeber, on TV, that would sometimes show a short newsreel of Walter Lance, perhaps drawing the cartoon cels for production?